Jack Chick, evangelist cartoonist and anti-Catholic firebrand. How anti-Catholic cartoonist Jack Chick became a figure of camp fascination. 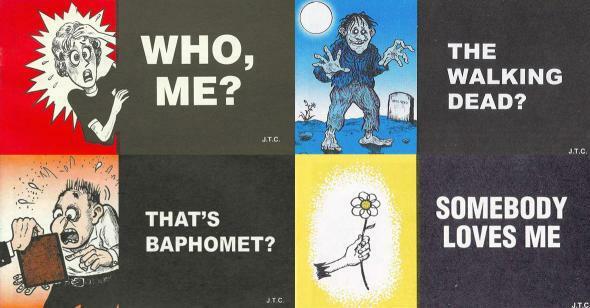 Covers from Jack Chick’s tracts. Jack Chick—fundamentalist cartoonist, outsider artist, and purveyor of evangelist tracts—died Sunday at 92. The grand theme of Chick’s lurid cartoon pamphlets was that anyone who rejected his particular strain of Christianity would suffer forever in hell. His publications railed against Masonry (“Satan is the true force behind Masonry”) and Halloween (“Satan loves Halloween”). Evolution, communism, Harry Potter, Family Guy, The Walking Dead, and Christian rock music were of the devil, too. His work smeared faiths including Islam, Judaism, and Mormonism. But his particular obsession with the Catholic Church was notable for both its persistence and how it fell into near-total obsolescence among his fellow Protestants within just a few decades. Chick was born in Los Angeles in 1924 and was drawn to devout faith while listening to The Old Fashioned Revival Hour, an evangelistic radio program, on his honeymoon. Inspired by 19th-century revival preacher Charles Finney, Chick directed his early cartoons at Christians who had grown complacent in their faith. His tracts can be mesmerizing in their blatant ugliness, both aesthetically and ideologically. In a tract on homosexuality, a gay dentist introduces his “wife,” Charles, to a classroom of aghast children, while grotesque devils frolic around the men; when an angelic young boy asks if the men are “queers,” his monstrous teacher threatens to send him to the principal. And when I think about what Al Smith went through, it’s important to just reflect how groundbreaking it was for him, a Catholic, to be my party’s nominee for president. Don’t forget—school boards sent home letters with children saying that if Al Smith is elected president, you will not be allowed to have or read a Bible. Voters were told that he would annul Protestant marriages. And … people even claimed the Holland Tunnel was a secret passageway to connect Rome and America, to help the pope rule our country. Indeed, (non-Chick) cartoons during Smith’s unsuccessful campaign against Herbert Hoover showed the Democrat kneeling in deference to a cardinal, being “inflated” by the pope, and stocking his Cabinet with berobed clergymen. Echoing the fears of many, the Atlantic Monthly published an open letter asking whether Smith would be more loyal to Rome than to the United States. Though Chick had to borrow money and start his own company to produce his tracts, the quantity of his output and the exuberance of his writing and illustrations gradually turned him into a figure of camp fascination. He produced his first tract in 1961; America had just inaugurated its new and glamorous first Catholic president, and Chick’s anti-Catholic fervor was already falling out of fashion. But if his retrograde fundamentalism was far outside the mainstream of American Christianity, he had a huge reach nonetheless. His tracts, nicknamed “chicklets,” were flimsy little rectangular booklets that churches and individuals were encouraged to purchase in bulk. (The tracts currently sell for 17 cents each; one back-of-the-envelope estimate suggests Chick didn’t make much money off them.) The idea was that Christians would carry the tracts with them and hand them out to nonbelievers everywhere they went. Though reports vary as to how many pamphlets the ministry has distributed over the years, everyone agrees it’s in the hundreds of millions. Chick’s evangelistic method of sprinkling tracts around like Johnny Appleseed has largely fallen out of favor, as the evangelical magazine Christianity Today pointed out in its obituary for Chick. His approach to Catholicism, meanwhile, is so passé among Protestants that it can be read as almost confusing now. In a 2005 book on Protestant-Catholic relations called Is the Reformation Over?, authors Mark Noll and Carolyn Nystrom point out that Chick’s most notorious anti-Catholic comics were widely condemned by Protestants at the time, and evangelical news outlets quickly debunked many of his claims. “The hostilities that Jack Chick markets would have been well at home in the 1840s or 1890s,” they write. “Now they are on the margin.” It says something that at the Al Smith dinner, both candidates seemed more comfortable with New York’s archbishop than they were with each other. Chick would have been appalled by that. You might even say he’d be in hell.